A Bajoran poet emerges from the wormhole after 200 years and claims that he is the Emissary, returned to Bajor to help bring back old traditions. Meanwhile, Keiko returns to the station with news that she is pregnant. It's nice to see Keiko and Molly again. The episode establishes very quickly that Sisko is getting a little more comfortable in his role as Emissary, though he still has a hard time "being a religious icon." This sets up his character's conflict throughout the episode: should he defend his role, or should he willingly give it to someone else? It's fascinating trying to look at this episode from Akorem Laan's point of view. Here's a guy who thinks he's only been gone a few days and discovers that he's been gone for 200 years and that he's posthumously become a world-famous poet whose works are being taught to school children. That's a trip, man, even without his believing that he is the Emissary of the Prophets. I love Worf's reaction when he is told that Keiko is going to have another baby: "Now?!" On the surface, this episode is about Sisko, but the character who has the biggest internal crisis to deal with is actually Kira. Having said that, there is an interesting ethical dilemma presented to Sisko. Does a person, either as an outsider or not, have the right to interfere with the religious beliefs of others simply because he or she sees a social outcome that seems wrong? Star Trek has dealt with this problem repeatedly in TOS and TNG (almost every time the Prime Directive comes up), but we've never seen how Sisko and the DS9 writers handle it. Unfortunately, the plot kind of skips over the dilemma instead of facing it head-on. Sisko coming back from the wormhole without Akorem Laan is awfully shady. Are you telling me that nobody is going to doubt Sisko's version of the story? Everybody who has just thrown his or her life into utter chaos to return to the old ways is just going to go back to normal and say, "Oh, I guess that Starfleet guy was the real Emissary all along, and I'm sure he didn't straight up murder Akorem Laan over a question of power and influence"? This isn't a bad episode, all in all. Most stories about faith tend to be pretty cut-and-dry, but this one has some intelligent nuance to it. Unfortunately, the plot solution is deeply unsatisfying for multiple reasons, not the least of which is its utter pointlessness. 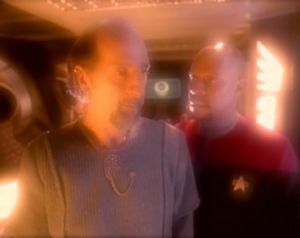 It would have been much easier and more believable--and perhaps even more poignant--if Akorem Laan had come back with Sisko and renounced his role as Emissary in front of everyone. This would avoid the inevitable time travel questions and would help alleviate the impression the story gives of the Bajoran people being subservient to the whims of their religion instead of being capable of rationality and progress on their own. As for the B-story involving Miles dealing with being thrown back into a family setting after spending a year as a bachelor, I like it because it feels real and doesn't get bogged down by any sort of preachiness or melodrama.